I Hereby Tag Hume’s Ghost! Hume’s Ghost is the author of “The Daily Doubter“, whose motto is taken from Voltaire: “Doubt is not a pleasant condition, but certainty is absurd.” His blog is one of the most perfectly intellectual blogs I’ve come across on the net, and so I am tagging Hume’s Ghost and “The Daily Doubter” with the Intellectual Blogger Award. What makes “The Daily Doubter” a perfect example of intellectual blogging at its best? To be sure, it is certainly not because Hume’s Ghost writes mainly about politics. Instead, it’s the almost unique way in which he writes about politics. Most of the political writing I’ve come across on the net is far from intellectual. At times it’s about political reportage, at times about drama, and at times about scoring points for one’s own views, but it is rarely about the lasting and underlying principles involved in politics. “The Daily Doubter” is different. Hume’s Ghost has one of the most sure footed grasps of the principles at stake in politics that I’ve yet to encounter on the net. His insight into those principles makes his writing universal. Even though he is nominally talking about American politics, the fact he talks about those politics in terms of the principles involved should make his discussions relevant to nearly everyone. In that respect, he’s very much like Mahendra, who created the Intellectual Blogger Award, and Nita, one of the first bloggers to win it. All three authors are capable of transcending their own cultures to get at things in ways that are universally relevant and important. 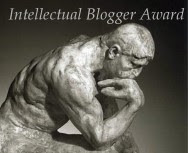 For those and other reasons, I am very pleased to tag Hume’s Ghost and “The Daily Doubter” with the Intellectual Blogger’s Award. Previous postI Hereby Tag Eric Michael Johnson! Next postI Hereby Tag Amuirin!